Wells Fargo Bank has a dirty-energy secret: it’s a leading lender to the fossil-fuel industry. That’s why we’re ramping up our new campaign against “Oily Wells” by marching 34 miles, from Palo Alto to San Francisco. We all feel concerned, anxious, or overwhelmed by climate change. By joining together in this bold, uplifting event we can face a challenge much bigger than ourselves, as civil rights marchers did before us. Marching is a way to make a difference and build relationships with fellow climate advocates. And by sharing your journey with your personal networks, you can grow support for the climate movement. Saturday, March 16 - March starts in Palo Alto Saturday morning. Route on sidewalks and shoulders along El Camino Real. Overnight in San Mateo. Sunday, March 17 - March continues along El Camino Real and Mission Street. Overnight in San Francisco (Excelsior). Monday, March 18 - March continues into San Francisco. Major rally at Oily Wells’s Headquarters at lunchtime. We warmly welcome partner organizations (both non-sectarian and faith-based) that wish to join our organizing efforts. Would your organization like to join us? Learn more here. Big banks play a pivotal role in funding climate chaos – and Oily Wells is probably the worst offender, backing many of the most environmentally disastrous fossil-fuel industry projects on the planet. Through a series of public actions, we’ll expose the bank’s dirty-energy secret and demand that it stop enabling Big Oil’s expansion, starting with Enbridge’s Line 3 tar-sands pipeline. What better way for Oily Wells to buff up its tarnished image than to become the nation’s first clean-energy bank? C’mon Oily... Be the first to go Fossil Free! 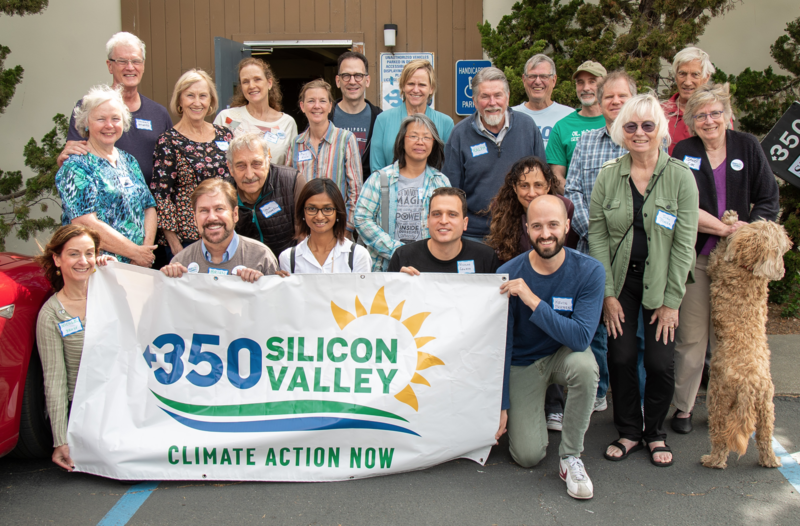 In June 2018, 350 Silicon Valley activists convened to devise a campaign that would accelerate the shift away from fossil fuels, by mobilizing mass support for nonviolent direct actions (including civil disobedience). With no big fossil-fuel infrastructure under construction on the San Francisco Peninsula, we figured that banks were a perfect proxy; and with the oiliest one of all headquartered in nearby San Francisco, we had our target. In August 2018 we held our first major arts build in San Jose. 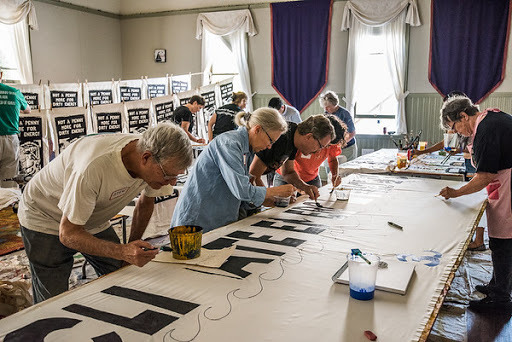 Led by 350.org Arts Organizer David Solnit and the Brooklyn-based activist hip-hop group The Peace Poets, 40 of us created a huge banner and silk screened signs for the Rise for Climate, Jobs and Justice march in San Francisco. 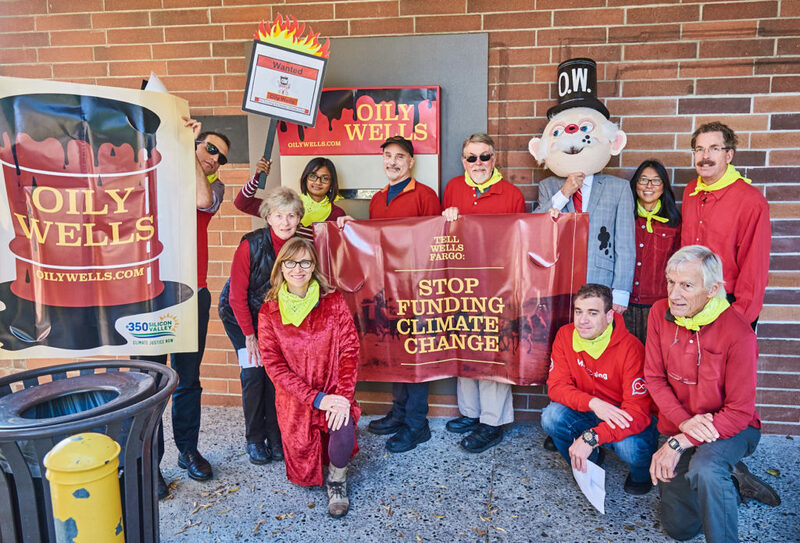 In early December 2018, we staged nonviolent protests at nine Oily Wells branches from Menlo Park to San Jose. 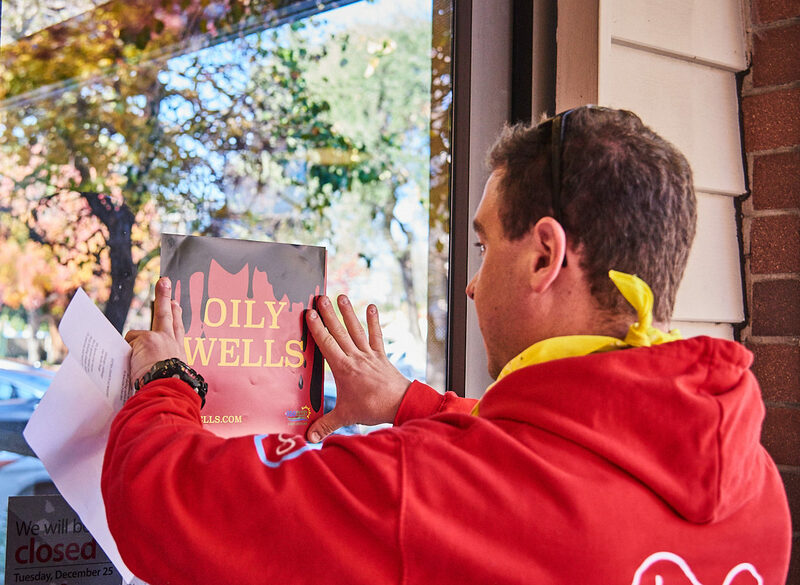 We delivered copies of a demand letter, addressed to the bank’s CEO Tim Sloan, and installed removable signs bearing the Oily Wells logo over ATMs and on doorways. And, of course, Oily Wells himself made his debut appearance.